As Arrogant A Pompous Blowhard As Donald Trump Is, Even HE Didn’t Claim He Would Lower The Level Of The Oceans And Heal The Planet. Even Trump aint that self-adoring. And that ought to show you what a truly sick puppy Obama is. Meet Barack Obama – Worst Failure, Biggest And Most Arrogant Narcissist – In History. And Then Meet Reality. He’s too humble. He isn’t the fourth best; he’s the best of all the best. At being an arrogant, patholotical narcissist who is so in love with himself that all the failure in the world isn’t enough to make him question even for a moment that he is the messiah, and the only messiah with whom we should have to do. Obama’s two signature “accomplishments” are his “stimulus” and what is most appropriately called ObamaCare. They are both so rotten and so unpopular that he is not mentioning them AT ALL as he runs for re-election. OK, so what “exactly” did Mr. Obama and his advisers think the stimulus — whose price tag hit $862 billion — would accomplish? Well, they said the stimulus would hold unemployment below 8 percent, and that joblessness would steadily drop to less painful levels in coming months and years. By now — December 2011 — unemployment if the stimulus passed was supposed to have dropped to about 6 percent, according to the administration’s projections. Did it work out that way? Hardly. Today’s unemployment rate is 8.6 percent — far higher than it was supposed to be by now if the stimulus passed. In fact, unemployment today is higher than the Obama administration predicted it would be even if the stimulus did not pass! And that’s only the tip of the iceberg. Joblessness has now been higher than 8 percent for 34 straight months — a record not seen since World War II! That raises an obvious question: If the first stimulus failed so miserably to do what the president said it would do, why should any consideration whatsoever be given to the idea of a second stimulus? Fwiw, the “about 6 percent” is a rounded figure; in fact, Obama predicted it would be 5.8% by now if he got his stimulus got passed. Which is kind of like George W. Bush saying that if he hadn’t been president, space aliens would have invaded and the entire human race would have been eradicated. The problem with this liberal analysis – other than the fact that the president is a dangerous mentally-ill malignant narcissist – is that it assumes what it is seeking to prove: Keynesian economics works, that’s just a statement of religious faith, and therefore Keynesianism clearly must have worked. Even if the Obama Keynesian stimulus utterly failed to come anywhere even close to matching their predicted claims of grandeur. We saw the hypocrisy of the excuses when the stimulus was such a failure that Obama stated claiming that he’d created “or saved” jobs. Such a barometer had NEVER been used in American history for good reason. And if Bush had tried to use it to claim that his agenda was really working out – just look at how many jobs he’d “saved” – the media would have rightly been all over him as a liar from hell for trying to pass such absurdity off. But not now. Obama is messiah. He cannot be wrong. If the stimulus clearly didn’t work on the physical level of reality, then it must have worked on the metaphysical level. The unemployment rate has gone down, but it has “gone down” with the massive caveat that nearly three people are giving up and abandoning the workforce completely (which means they no longer count against Obama’s unemployment record) for every one who actually finds a job. The truth is that Obama has lost 2.5 million jobs since he took office. These jobs have simply ceased to exist under Obama, as measured by the labor participation rate. The truth is that if Obama were measured by the same labor participation rate that Bush was measured by when he left office, unemployment would be at over 11.3% (according to an analysis by Reuters), rather than the 8.6% Obama is being lauded for by media propaganda. 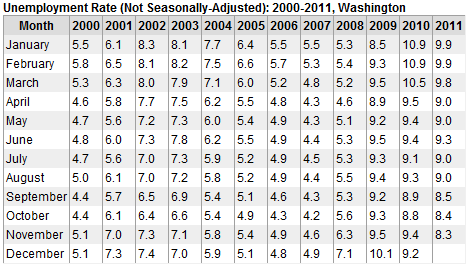 I mean, dang, even liberal Ezra Klein affirms that the real unemployment rate ought to be 11 percent. But Obama doesn’t have to worry. The number has gone down – no matter how falsely that number is calcuated or what it hides – and the mainstream media says Obama is doing a wonderful job. But DNC Chair Debbie Wasserman Schultz is actually able to get on TV and claim that unemployment didn’t go up under Obama. Because she is a liar from the party of liars who represent the king of all liars. Take a look at what Obama has done for “employment” with the teens he promised to help with his mandatory minimum wage hike that priced most young workers right out of jobs. Not that Obama gives a damn. He “saved” them. He’s moved on. And, oh, by the way, when Obama compares himself to FDR, it should be pointed out that FDR massively failed to do anything more than utterly sabotage our economy just as Obama has done. Take ObamaCare. Please, as the comics say. It is horribly unpopular, it will cost FAR more than the lying liberals and their false messiah said it would. And hopefully it will soon be overturned as UNCONSTITUTIONAL by the Supreme Court. We are at historic levels of unemployment, our nation having never seen such a disgrace since the last time a socialist ran the country. The misery index is the highest it has EVER been. We are at Great Depression levels in our housing situation. But don’t worry; to an arrogant malignant narcissist like Obama, all these things and many others are just “bumps in the road” compared to his majestic wonderfulness. If it isn’t Republicans’ faults that Obama has failed so wildly, it’s YOUR fault. You are, in Obama’s words, lazy. And soft. And if you are a conservative, a racist small-minded religious bigot bitterly clinging to his guns and his antipathy for people who don’t look just like him. None of it matters. Only Obama matters. He is the center of his own universe, and he’s doing fine. P.S. Here’s another “fwiw”: I did a quick search for Obama’s “lazy” remark. I actually couldn’t find it. Do you know why? I couldn’t find it because there were so many mainstream media “journalists” who rushed out to say that Obama really didn’t say what it sounded like he said after Obama said it. But if George W. Bush had said the same damn thing, don’t not believe for a millisecond that the same journalists who said Obama didn’t call Americans’ lazy and soft wouldn’t have been saying that Bush just said Americans were lazy and soft. We are watching what is happening in the socialist People’s Republic of North Korea right now. It’s not “the people’s,” as the claim of socialism always promises; it was Kim Jong Il’s “republic” – and now that “people’s republic” belongs to his idiot son. This is a country that deep inside a socialist dark age, to such an extent that the country is literally completely dark at night from space. Millions of North Koreans have starved to death. The country is told to continue being faithful to socialism. While a few such as Kim Jong Il dine on imported caviar, drink imported champagne and entertain themselves with their favorite Western prostitutes and films. But what does their press tell them? That their “Dear Leader” is doing a wonderful job taking care of them. And the North Korean “mainstream media” did everything it could to preach that gospel. We’ve seen that same thing in every socialist regime – from the Nazis (that’s national socialism) to the communists (that’s international socialism). And we have seen it in our own socialist regime that Democrats and their media propagandists have been trying to erect for years. We live in the days just before Antichrist. He will require everyone to take his mark, and every single human being on earth will have to take that mark or he or she won’t be able to buy food or anything else (Revelation 13:15-18). And when that time comes, the media will be assuring us that taking the mark will be a good thing, and that the people who won’t accept it are bad people who should be killed. The astonishing deceit you are seeing on the media every single day is just one more proof that those coming days are soon at hand. Well, at least he’s not arrogant, right? The aircraft was large, modern and considered among the world’s safest. But that night it was flying straight into a huge thunderstorm. Turbulence was extreme, and airspeed indicators may not have been functioning properly. Worse, the pilots were incompetent. As the plane threatened to stall they panicked by pointing the nose up, losing speed when they ought to have done the opposite. It was all over in minutes. Was this the fate of Flight 447, the Air France jet that plunged mysteriously into the Atlantic a couple of years ago? Could be. What I’m talking about here is the Obama presidency. Of course, it’s tempting to be immodest when your admirers are so immodest about you. How many times have we heard it said that Mr. Obama is the smartest president ever? Even when he’s criticized, his failures are usually chalked up to his supposed brilliance. Liberals say he’s too cerebral for the Beltway rough-and-tumble; conservatives often seem to think his blunders, foreign and domestic, are all part of a cunning scheme to turn the U.S. into a combination of Finland, Cuba and Saudi Arabia. I don’t buy it. I just think the president isn’t very bright. Socrates taught that wisdom begins in the recognition of how little we know. Mr. Obama is perpetually intent on telling us how much he knows. Aristotle wrote that the type of intelligence most needed in politics is prudence, which in turn requires experience. Mr. Obama came to office with no experience. Plutarch warned that flattery “makes itself an obstacle and pestilence to great houses and great affairs.” Today’s White House, more so than any in memory, is stuffed with flatterers. Much is made of the president’s rhetorical gifts. This is the sort of thing that can be credited only by people who think that a command of English syntax is a mark of great intellectual distinction. Can anyone recall a memorable phrase from one of Mr. Obama’s big speeches that didn’t amount to cliché? As for the small speeches, such as the one we were kept waiting 50 minutes for yesterday, we get Triple-A bromides about America remaining a “Triple-A country.” Which, when it comes to long-term sovereign debt, is precisely what we no longer are under Mr. Obama. Then there is Mr. Obama as political tactician. He makes predictions that prove false. He makes promises he cannot honor. He raises expectations he cannot meet. He reneges on commitments made in private. He surrenders positions staked in public. He is absent from issues in which he has a duty to be involved. He is overbearing when he ought to be absent. At the height of the financial panic of 1907, Teddy Roosevelt, who had done much to bring the panic about by inveighing against big business, at least had the good sense to stick to his bear hunt and let J.P. Morgan sort things out. Not so this president, who puts a new twist on an old put-down: Every time he opens his mouth, he subtracts from the sum total of financial capital. Then there’s his habit of never trimming his sails, much less tacking to the prevailing wind. When Bill Clinton got hammered on health care, he reverted to centrist course and passed welfare reform. When it looked like the Iraq war was going to be lost, George Bush fired Don Rumsfeld and ordered the surge. Mr. Obama, by contrast, appears to consider himself immune from error. Perhaps this explains why he has now doubled down on Heckuva Job Geithner. It also explains his insulting and politically inept habit of suggesting—whether the issue is health care, or Arab-Israeli peace, or change we can believe in at some point in God’s good time—that the fault always lies in the failure of his audiences to listen attentively. It doesn’t. In politics, a failure of communication is always the fault of the communicator. Much of the media has spent the past decade obsessing about the malapropisms of George W. Bush, the ignorance of Sarah Palin, and perhaps soon the stupidity of Rick Perry. Nothing is so typical of middling minds than to harp on the intellectual deficiencies of the slightly less smart and considerably more successful. But it takes actual smarts to understand that glibness and self-belief are not sufficient proof of genuine intelligence. Stupid is as stupid does, said the great philosopher Forrest Gump. The presidency of Barack Obama is a case study in stupid does. Oh, well. Never mind about that thing about him not being pretty much the world’s most self-exalted specimen in the history of the human race. Note the stunning similarity in character: yes, the narcissist is a complete screw-up, but somehow he believes himself to be absolutely magnificent. Have you ever encountered one of those punk kids who was just as certain that he was smarter than everybody else as he was that he was God’s gift to the entire universe? Usually these arrogant little vermin end up in prison because they just keep going farther and farther and getting away with crap until they finally take that one giant step too far. But occasionally they get elected president before the truth emerges about them. When that happens, in the words of former chair of Obama’s council of economic advisers Christina Romer, we are all “pretty darned f—ked.” At least, that is, until somebody finally does something to control the irritating little turd. If the Science Guy passes out and nobody tweets it, did it happen? Last night in front of an audience of hundreds at a presentation at the University of Southern California, TV personality Bill Nye — popularly known as the “Science Guy” — collapsed midsentence as he walked toward a podium. Early indications are that Nye is OK, but what’s odd about the incident isn’t so much Nye’s slight health setback as the crowd’s reaction. Or, more precisely, its nonreaction, according to several accounts. It appears that the students in attendance, rather than getting up from their seats to rush to Nye’s aid, instead pulled out their mobile devices to post information about Nye’s loss of consciousness. According to the school’s student news outlet, the Daily Trojan, Nye asked, “What happened? How long was I out?” when he regained consciousness. Briskly picking up his humorous persona, he added, “Wow, that was crazy. I feel like Lady Gaga or something.” Nye’s publicity team didn’t immediately respond to The Lookout’s request for comment on the episode. Still, in the annals of the digital public’s civic indifference, the Nye incident is nowhere near as disturbing as another episode reported in New Orleans earlier this week, which oddly enough also involved a humorist. Anthony Barre, a New Orleans man popular for his acid-tongued comic performances on YouTube using the handle “Messy Mya,” was murdered on the streets of the city’s 7th Ward — the historically Creole neighborhood chronicled in the HBO series “Treme.” As he lay dying, witnesses at the scene took to the Internet to chronicle the tragedy in real time, even posting photos of his body lying in a pool of blood. Moments after gunshots roared through the 7th Ward on Sunday night, a lone snapshot appeared on the Internet. In it, a 22-year-old man is lying cheek to the ground, crimson pooling around his neck. His eyes are closed, his torso curled. Chaos explodes around him, with the arms of others pressed to the back of his head. And someone is holding a cell phone just inches from his face. This is how the world learned of Messy Mya’s death. Charley Price: This town reminds me of something from the Bible. James Butler ‘Wild Bill’ Hickok: Which part? Charley Price: The part right before god gets angry. “But realize this, that in the last days difficult times will come. For men will be lovers of self, lovers of money, boastful, arrogant, revilers, disobedient to parents, ungrateful, unholy, unloving, irreconcilable, malicious gossips, without self-control, brutal, haters of good, treacherous, reckless, conceited, lovers of pleasure rather than lovers of God, holding to a form of godliness, although they have denied its power; Avoid such men as these” (Saint Paul, in 2 Timothy 3:1-5). And dang, doesn’t texting and tweeting and video cameras ever bring to life the “malicious gossips” section of this prophetic passage? I can’t even imagine a man collapsing in front of me and not rushing over to try to help him. So imagine how unimaginable it must be for me to imagine a huge crowd of people texting and twittering while a man falls down and lies unconscious on a stage. A week ago I had a VA (Veterans Administration) appointment. A man in a wheelchair was trying to get through a door that shut on him. Ten of us immediately got up from our seats to help him. But that was a far, FAR better generation than “the last days” group we’ve got now. It makes me nauseous to think about these effete, sanctimonious, sycophantic, self-righteous snobs. These are the punks who voted for Obama in such huge numbers in 2008. They’re the ones who lecture us about the environment and taxes and gay marriage and abortion and illegal immigration and ObamaCare and big government and all the other politically correct crap. “And when our parents’ generation couldn’t answer that question, that’s when the law started to change. There are some things about our world that you know that older people don’t know,” he continued. “Why would that be? Well in a period of rapid change, the old assumptions sometimes just don’t work anymore because they’re out of date,” Gore said. That’s what I call a triple whammy: zero progress with an essential voter block; erosion of confidence in the Democratic Party; and a whopping load of Democrats don’t like him, don’t trust him, don’t think he’s qualified, and actually prefer his Republican opponent over him. Sounds like things aren’t going all that great in Obamaland, the Peoples’ Socialist Republic of. And when you add to these woes the problems he’s having in crucial swing states he desperately needs to win (like Pennsylvania), and the six point gulf between what the polls say and how he will likely actually do in November, and Obama’s problems begin to stack up like a house of cards. But I would submit that this is the same overconfident and arrogant campaign that was being widely criticized by Democratic insiders only ten days ago. Americans are outraged over the housing finance meltdown, and Obama has benefitted with a short term bump in the polls. But few analysts believe that the Wall Street turmoil will be decisive, and some feel that if Americans are truly frightened, they will turn to McCain, who leads Obama in perceived trust, leadership, and experience according to poll internals. 1) Democratic Party advisors are deeply concerned about the Obama campaign. 2) These advisers are particularly concerned because they believe Obama is actually doing 4-6 points WORSE than the polls indicate. 3) The Obama campaign – in a state of denial – is flat-out ignoring the advice from Democratic strategists who have run successful campaigns. 4) The primary reason for this state of denial according to these strategists appears to be arrogance. Barack Obama and his senior advisers are under fire for ignoring the advice of Democratic senators and governors who are concerned that they do not know how to beat John McCain. The Democratic presidential candidate’s slump in the polls has sparked pointed private criticism that he is squandering a once-in-a-generation chance to win back the White House. Party elders also believe the Obama camp is in denial about warnings from Democratic pollsters that his true standing is four to six points lower than that in published polls because of hidden racism from voters – something that would put him a long way behind Mr McCain. The Sunday Telegraph has learned that senators, governors and union leaders who have experience of winning hard-fought races in swing states have been bombarding Obamas campaign headquarters with telephone calls offering advice. But many of those calls have not been returned. After leading throughout the year, Mr Obama now trails Mr McCain by two to three points in national polls. Party leaders and commentators say that the Democrat candidate spent too much of the summer enjoying his own popularity and not enough defining his positions on the economy – the number one issue for voters – or reaching out to those blue collar workers whose votes he needs if he is to beat Mr McCain. Others concede that his trip to Europe was a distraction that enhanced his celebrity status rather than his electability on Main Street, USA. Since Sarah Palin was unveiled as Mr McCain’s running mate, the Obama camp has faced accusations that it has been pushed off message and has been limp in responding to attacks. Mr Obama tried to answer that critique on Friday when he responded in kind, issuing an attack advert depicting his Republican opponent as out of touch and mocking the 72-year-old Mr McCain’s confession that he does not know how to use email. He rammed home the point during a rally in New Hampshire, pointing out Mr McCains recent admission that he was divorced from some of the challenges of ordinary Americans. Mr Obama’s campaign manager, David Plouffe, called it the first day of the rest of the campaign. But that was the fourth time in the last nine months that Mr Obamas team have been forced to declare that the gloves are coming off. And Mr Plouffe’s dismissal of Democratic doubts as hand-wringing and bed-wetting only served to reinforce the growing doubts about what some see as a bunker mentality among Obamas inner circle – where outside advice, even from highly experienced people, is not welcomed. The Democratic strategist told The Sunday Telegraph: “They think they know best. They don’t return calls. There are governors and senators calling them up with ideas. They don’t get back to them. Mr Obama has never won an electoral contest against a strong Republican candidate. David Axelrod, his chief strategist has been hailed as a political genius for beating the Clinton machine, but Democrats now point out that he has never run a successful campaign in the heartland states like Ohio, Pennsylvania, Michigan and Virginia, which will decide the election. His expertise is in mobilising young, educated and black voters in urban areas. Party elders are also studying internal polling material which warns the Obama camp that his true standing is worse than it appears in polls because voters lie to polling companies about their reluctance to vote for a black candidate. The phenomenon is known in the US as the Bradley effect, after Tom Bradley, a black candidate for governor of California who lost after leading comfortably in polls. The strategist said: “I’ve seen memos where they’ve been told to factor in four to six points for the Bradley effect, but they’re in denial about it. Other Democrats are openly mocking of Mr Obama’s much vaunted “50-state strategy”, in which he spends money campaigning throughout the US in the hope that it will force Mr McCain to divert funds to previously safe states. Critics say a utopian belief in bringing the nation together has trumped the cold electoral calculus that is necessary to triumph in November. Doug Schoen, a former pollster for Bill Clinton, last week declared it insanity not to concentrate resources on the swing states. The Democratic strategist said: “My Republican friends think its mad. Before Sarah Palin came along we were investing money in Alaska, for Christ’s sake, that could have been spent in Ohio and Pennsylvania. The one thing everyone agrees the Obama camp have woken up to is the toxic effect on their chances of Mrs Palin’s arrival on the national scene. Polls show that white women voters, attracted to her down home virtues, now support Mr McCain by a margin of 12 points, the same lead among white women that George W. Bush enjoyed over John Kerry in 2004. Until recently, Mr Obama led among that group of voters by six points. Peggy Noonan, the former Reagan speechwriter, blamed the defection of women voters from Mr Obama on the atom bomb of ritual abuse by left-wing bloggers and Democratic officials, painting Mrs Palin as a bad mother and religious weirdo. The Republican strategist Dan Schnur said that the effect was to repel blue collar, family-oriented voters. “They didn’t like Obama in the primaries and voted for Hillary. And they still don’t like him now so they’re voting for Palin. On Thursday Mr Obama did take advice from Bill Clinton, who is understood to have suggested ways to show those workers that he cares, an area where the former president excelled. But it is a measure of his plight that the man who derailed the ambitions of Mrs Clinton, the most powerful woman in Democratic politics, now needs help from her husband to overcome the popularity of another alpha female who may be an even greater risk to his White House ambitions. I guess you can add “the English language” to that list of things that Barack Obama thinks Americans are bitterly clinging to. Barack Obama came under a lot of fire for little “bitter” remark. I myself was actually much more upset by the incipient Marxism that Barack Obama revealed in his thinking, but the criticism that stuck was that Barack Obama was arrogant, and an elitist. He went to some bunch-of-money per plate pinky-in-the-air fund raising event in San Francisco, and proceeded to tell a bunch of fellow arrogant elitists what he really thought about those idiot hicks over in Pennsylvania. (CNN) — Sen. Barack Obama is saddled with a potentially toxic image problem: that he has an elitist attitude. He talks down to white people too (excepting European white people, of course). You can say that our first metrosexual candidate for President is an equal-opportunity condescending elitist jerk. He looks down on pretty much everybody. Obama’s right in a narrow sense, of course: Americans for the most part haven’t bothered to learn a bunch of other languages. Instead, Americans have occupied themselves with building such a great, such a wealthy, such a powerful, such an influential country, that everybody else in the world found it necessary to learn to speak English. Unlike Barack Obama, I like the American way better. On a sheer practical level, one must understand the sheer size of the United States relative to Europe, and the absence of the influence of foreign languages upon American culture. In terms of size, if you overlay the United States over Europe, the U.S. literally either covers or overlaps Spain, France, Germany, Poland, Czech Republic, Italy, Greece, Estonia, Latvia, Lithuania, Belarus, Czech Republic, Slovakia, Austria, Hungary, Slovenia, Croatia, Bosnia Herze-govina, Serbia and Montenegro, Ukraine, Romania, Moldova, Bulgaria, Macedonia, Albania, Turkey, Russia, Morocco, Algeria, Tunisia, Libya, Sweden, Libya, Egypt, Israel, Jordan, and Syria. We don’t have anywhere NEAR the constant “international contact” with languages that Europeans routinely have due to the small size of the countries, and we’re isolated by two oceans to boot. It’s simply ridiculous to expect us to have the same grasp of other languages that people living in countries you can drive through in a few hours have. In terms of influence, our only foreign language-speaking neighbor – Mexico – is frankly insignificant to the overwhelming majority of Americans. Mexico’s economy has been in a perennial state of shambles for over a century now. Apart from being polite, why should Americans learn to speak Spanish? And related to that last point, just what language should Americans learn? French? (Seriously, WHY!?!?) Chinese? Russian? Maybe we should learn Arabic, so we can better beg them for oil if – heaven forbid – Barack Obama gets elected and cuts off all our domestic oil production? The simple fact of the matter is that Americans haven’t learned foreign languages because we haven’t needed to. And if Barack Obama is somehow ashamed of us for that, that’s really just his problem, isn’t it? There’s another thing about Obama’s “English” remark that underscores his arrogance and elitism: he frankly thinks he knows better than an overwhelming majority of Americans on the issue of just what language Americans ought to be speaking in this country. Eighty-five percent (85%) of Americans believe that English should be the official language of the United States. The latest Rasmussen Reports survey of 1,000 adults found that only 11% disagree and 4% are not sure. You know who issued Executive Order 13166 into law requiring multilingualism in federal documents? The last Democrat president we elected. He smuggled this unpopular edict into law in the waning days of his presidency. That’s just the kind of exposure to foreign languages that Americans don’t need. And it’s just the kind of stuff that Barack Obama – “I know better than you, merci beaucoup” – is going to give us if he’s elected President. CHARLES KRAUTHAMMER, SYNDICATED COLUMNIST: What impresses me is his audacity. Everybody moves to the center after securing the nomination. There’s nothing new under the sun there. He did it in a particularly spectacular way with the flips that you talked about. There are a couple of others on NAFTA and flag pins, and he does it all within about three weeks. It’s sort of unprecedented. But he goes way beyond that. On each of these he pretends that he has never changed. He says, yes, I said the gun bill was constitutional and I supported it. And now he supports the Supreme Court decision that rules it unconstitutional, and pretends it is the same decision. But then he goes beyond that, reaching an almost acrobatic level of cynicism here, in which he says, as you indicated, Fred, anybody who believes otherwise, anybody who believes he is not actually a flipper and he hasn’t actually changed, is himself cynical, or, as he puts it, “steeped in the old politics,” and so cynical that they can’t even believe that a politician like him would act on principle. What non-political no-self-interested reason explains his change on campaign finance other than the fact that he has a lot of money and he would lose it otherwise if he had stuck to his principles? What non-self-interested reason explains his flip on guns, on FISA, on the flag pins, on everything? But he thinks he–what impresses me is his intellectual arrogance. He thinks everyone is either a fool who would believe all this, or a knave who is somehow distorting his words. So Barack Obama is pretty much “talking down” to the American people as a matter of routine. The only thing worse than being “talked down to” is being dumb enough to allow the tactic to succeed. Tell you what: come November, I hope the American people overwhelmingly vote to say “good bye” to Barack Obama. They can use as many languages to say it as they want: Adios. Au Revoir. Auf wiedersehen. Ciao. Sayonara. Ma’a salaamah. Namasté. Zai jian. And please don’t let the door hit your rear end on the way out.